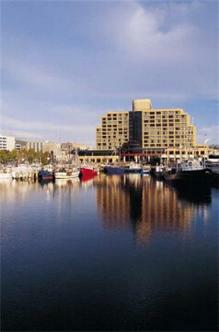 The Hotel Grand Chancellor is located on the waterfront in central Hobart. The hotel provides the ultimate accommodations with majestic views over the Derwent River, Mount Wellington, and the city. It is just a stone's throw from the Central Business District and the many attractions of Hobart. Grand Chancellor is the ideal base for the Tasmanian holiday or business trip. To make your stay a grand experience, the comforts and facilities of this 4 1/2-star superior hotel are at your disposal.Broadband access is available in all guest rooms at a charge of .55 cents per minute capped at usd 27.50 for twenty four hours. Megabyte download limit is 50.